SHOW ME YOUR WARDROBE.COM: Thank you Vogue.co.uk! 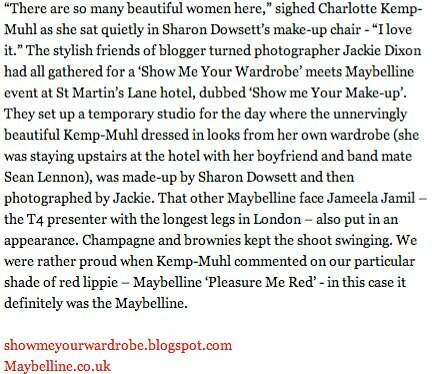 In case you missed it, Maybelline and I teamed up for a 'Show Me Your Make-up' (I know, I know, we're geniuses) collaboration whereby we created a blogging-meets-fashion-meets-beauty set up: a pop-up luxury studio at St Martins Lane Hotel. The very beautiful Kemp Muhl and Jameela Jamil modelled, I took the pictures and the very talented Sharon Dowsett did make-up. 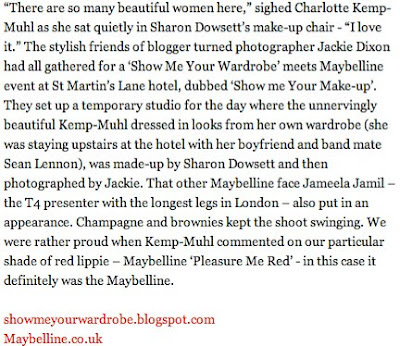 We also invited people to join us exclusively on set and Vogue wrote it up beautifully (with a few behind the scenes photos thrown in), see below. 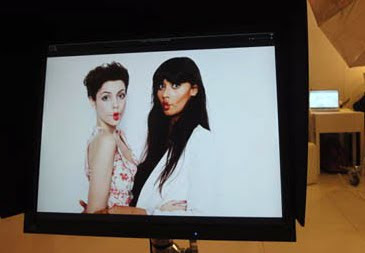 And can I just say, how little do I look next to Jameela Jamil! Oh, and just quickly, a special thank you to Tess at Maybelline for her infectious enthusiasm. The lovely Bianca Tuovi on hair duty with Kemp (above). Kemp and Jameela on the left and (a very little looking me) and Jameela on the right. Bianca Tuovi look chic and timeless simply sitting there, great captive of the moment picture.